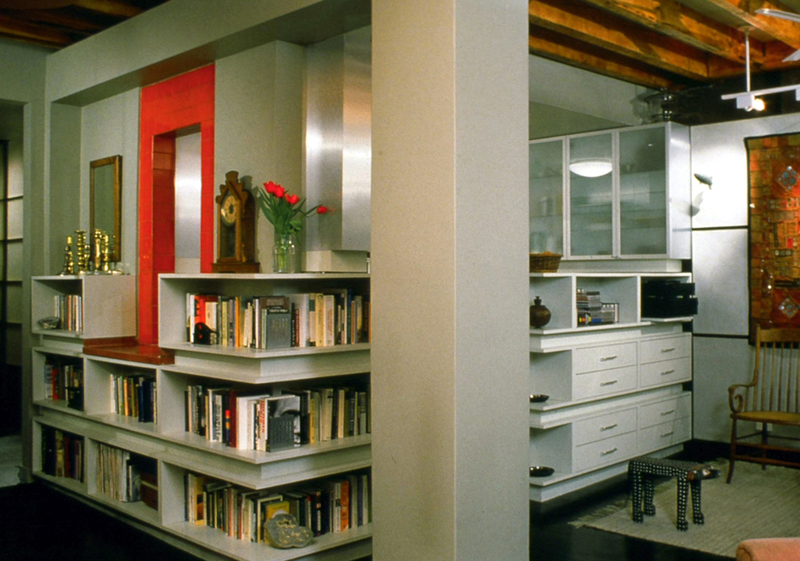 A 900 square foot tenement apartment in the Hell's Kitchen neighborhood was renovated as a loft. Living spaces feature exposed wood beams, ebonized wood floors, and cement wall panels floating in front of the exposed brick. The primary bedroom is defined by custom maple and fiberglass sliding panels, a high woven-grass wainscot, and cork tile. Built-in shelves and cabinets provide storage while making efficient use of limited space, and translucent panels on doors and walls offer both privacy and filtered light. The bath is an abstract composition of brightly colored glass and ceramic tiles. An undistinguished one-bedroom, within a row of brownstones combined & converted in the 1970’s, was stripped and rebuilt for a couple. Scope included new millwork in the kitchen, bath, bed & living rooms, upgraded plumbing & electric, plaster & painting. Color was introduced via painted walls and a patterned mosaic backsplash in the kitchen. A large disco-era bachelor’s bathroom was redesigned using slate and glass tiles, and translucent resin-enclosed storage. In addition to new fixtures and fittings, a custom shower was installed at one end, with a raised floor, troth drain, and concealed lighting. This 1000 square foot pre-war apartment in Washington Heights was transformed to create a calm, zen-inspired environment. 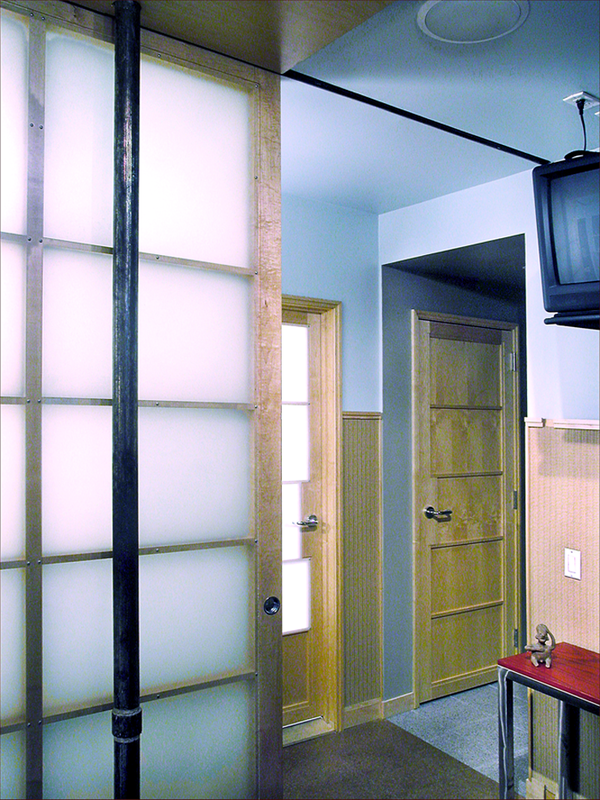 Emphasizing efficient use of space, the home-office alcove disappears behind translucent sliding panels (elsewhere, employed to insulate exterior steel casement windows). A cozy bedroom is fully lined with mahogany storage units and shelving. With its large shower and two sinks, the spa-like bath employs a range of natural materials – glass, slate, porcelain tile and mahogany.